revelation and a complete sensation. 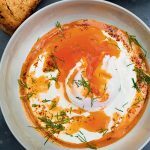 If you can’t get the Aleppo pepper, also known as pul biber or Turkish red pepper flakes, which has a mild, almost sweet heat and a distinctive lemoniness, you could substitute paprika, adding a pinch of crushed red pepper flakes. But, in these days of online grocery shopping, I’d encourage you to go for the real thing. the brunch station at a busy restaurant for months on end, you’ll be hard pushed to turn out perfectly formed poached eggs every time. So do not feel that anything less than perfection is a mistake, and accept a little straggliness here and there. Excerpted from the book AT MY TABLE by Nigella Lawson. 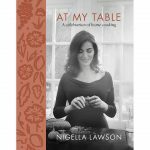 © 2018 by Nigella Lawson. Reprinted with permission from Flatiron Books. All rights reserved. Photography by Jonathan Lovekin. 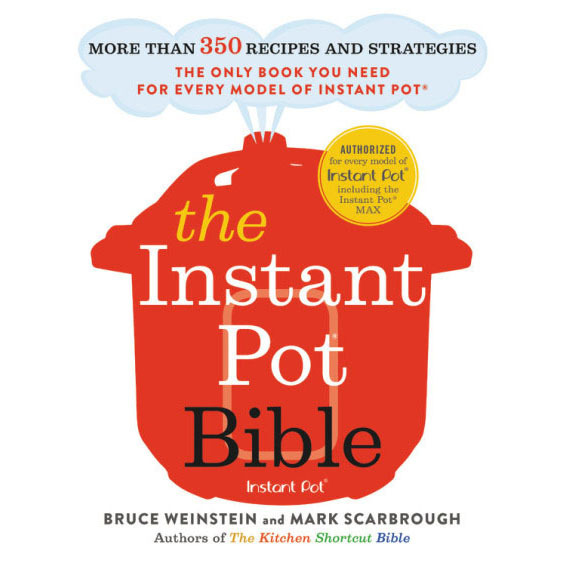 Fill a wide-ish saucepan (I use one of 9 inches diameter) with water to come about 1½ inches up the sides of the pan. Put it on the heat and cover so that it heats up faster. Line a large plate with some paper towels, get out a slotted spoon, and put both near the pan now. Now fill another saucepan – on which a heatproof bowl can sit comfortably – again with water to come 1½ inches up the sides, and bring to a boil. Put the yogurt in said bowl, stir in the garlic and salt, and sit it on top of this pan, making sure the base of the bowl doesn’t touch the water. Stir it until it gets to body temperature and has the consistency of lightly whipped cream. Turn off the heat and leave the bowl as it is, over the pan. Melt the butter gently in a small saucepan until it is just beginning to turn a hazelnutty brown (this is why, in classic French cuisine, it’s known as beurre noisette), but make sure it’s not actually burning. Turn the heat off under the pan, then stir in the olive oil, followed by the beautiful red pepper flakes; it will foam up fierily. Leave to one side while you get on with the eggs. And this is when you should be thinking of putting the toast on. When you are ready to poach the eggs, crack the first egg into a fine mesh strainer suspended over a small bowl, then lift it up a little and swirl gently for about 30 seconds, letting the watery part of the white drip into the bowl. Gently tip the egg into a small cup or ramekin and, aiming for the white, add 1 teaspoon of lemon juice; I know everyone else says vinegar, but I just don’t like the taste of it on the egg, and the lemon does the trick just the same. Proceed as above with the second egg. When the poaching water is just starting to simmer, take a cup or ramekin in each hand and gently slide in the eggs, one on each side of the pan. Turn the heat right down so there is no movement in the water whatsoever, and poach the eggs for 3–4 minutes until the whites are set and the yolks still runny. Transfer the eggs with your slotted spoon to the paper-lined plate to remove any excess water. Do remember to switch off the heat. Sorry to state the obvious, but I have too often left it on this low without noticing. 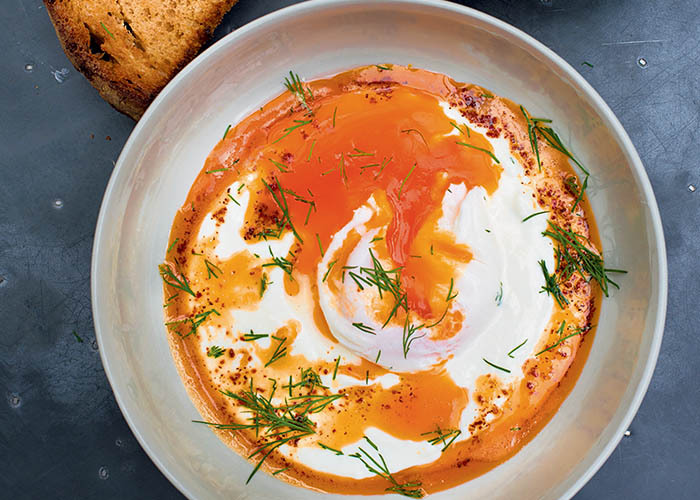 Divide the warm creamy yogurt between two shallow bowls, top each with a poached egg, pour the peppery butter around and slightly over the yogurt, scatter the chopped dill on top, and eat dreamily, dipping in some thick well-toasted bread as you do so. What can isbstute for the yogurt (if anrthing).? I do not use milk products. Ithe sounds so good. Thank you. I think in this case, based on how Nigella described the dish, the Greek yogurt is essential.